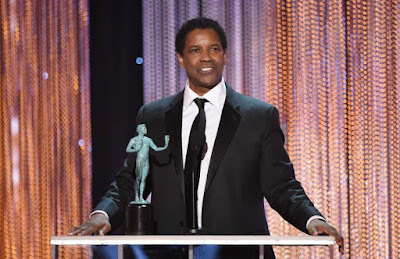 In a move great enough to nearly return the Earth back on its axis in these horrifying times, Denzel Washington finally wins a Best Actor Screen Actors Guild Award for his tremendous performance in the incredible Fences. I say finally because, astonishingly, Washington has never received this award ever throughout his illustrious career. And also because it's damn time that voters finally get it right that his performance is leaps and bounds more impressive than Casey Affleck (Manchester by the Sea). And if that wasn't wonderful enough, they turn around and hand the award for best cast to none other than Hidden Figures -- a movie that dares to put brilliant black women front and center and ahead of their mediocre white male counterparts -- sending Oscar pundits that had counted on the precious La La Land winning the top prize of the evening into a tailspin. 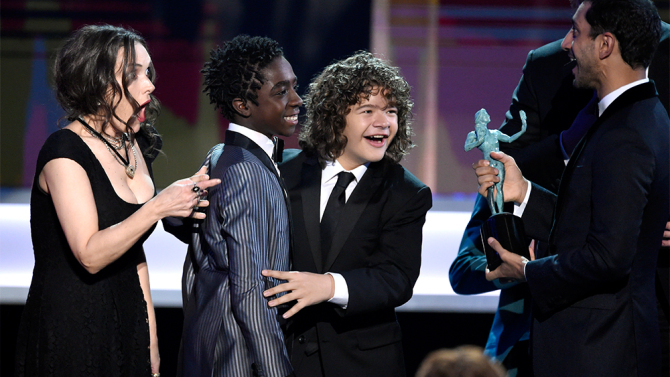 And though it's on the TV side, I'd be remiss if I didn't mention another fantastic win of the evening: Stranger Things, which won for its kickass (and adorable) cast. Long live genre! How do you not love this reaction? Winona Ryder gives good face. Shout out to actor David Harbour who accepted the award with a passionate speech for today's times, highlighted by the poignant "We will hunt monsters." That's a drop-the-mic moment, if I ever heard one. With the exception of Stone's win, if the Oscars go a similar way than these Screen Actors Guild Awards, I would be okay. Just saying.